The primaERP application is a great tool for everybody who sells their time to their clients. In the Time Tracking module you can measure how much time you spent on your project. In the module Billing you can easily change your time into money. Let us show you how to set individual rates for various clients or projects. Many professionals prefer to charge a fixed price for the whole contract or a monthly fee regardless the number of working days in the actual month. 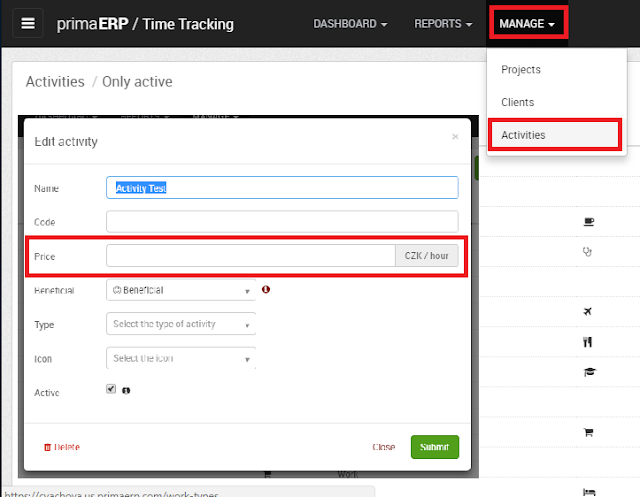 Have you tracked your time in primaERP? Read how to create bills with fixed prices in primaERP Billing. If you want to charge hourly, define your hourly rate in Manage > Activities. Just select the activity and fill in the Price field. If you use the evaluated activity in your time record, the tracked time will automatically multiply by the hourly rate and you will see the price for this particular piece of your work. If the time of billing comes, fo to the Billing module, select the client and press Create bill. Select the time records that you want to include to the bill and press Add to bill. Than you can save the bill and work with it further. Do you have regular customers whom you charge better prices? Do you have different hourly rates for each project? You can manage this easily with primaERP. A much more elegant solution is to just enter the client and/or project and to choose a general type of activity (e.g. graphical design). You can differentiate the individual prices in the module Billing. 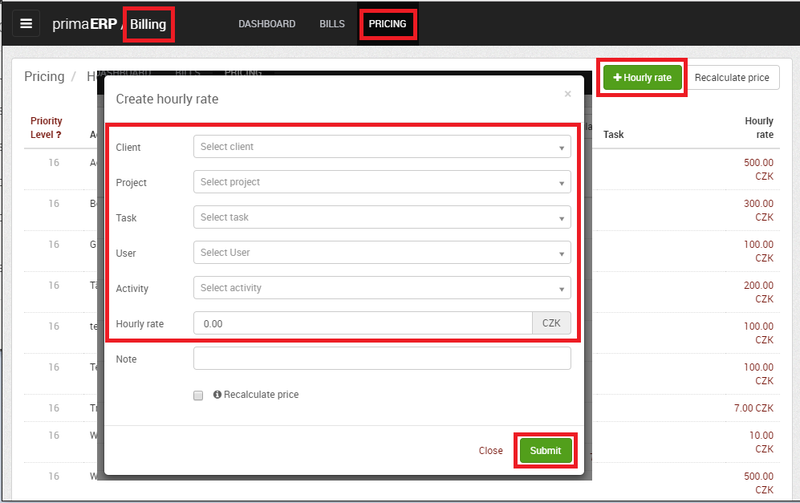 In the module Billing go to Pricing > + Hourly rate. Here you can specify prices for various combinations of parameters Client - Project - Activity - Task. If you specify in the record that you do graphical design for client A, the system will count the price for the work based on the price list. For detailed information about priorities in the pricing and how counting the final price exactly works check the article in primaERP Uservoice. For charging a fixed price regardless the amount of worked hours start creating a new bill in Billing and add a Manual item. Using the Manual item you can enter not only fixed prices but also any any costs including travel expenses and material. If you don't want to have the time records connected to this project displayed as "Time records to bill" on the Billing Dashboard, you can add them to the Bill. In Billing > Pricing set the he hourly rate to 0, because the price in independent on the amount of working hours. Now it is up to you how much information about the time records you want to show to your client. In Settings you can add or remove Columns at your discretion. The news in primaERP is that now you can also switch off the column Duration which hides from the client the amount of working hours. Whether you choose to charge a hourly rate or a fixed price, primaERP gives you the tools to create the bill you need. Ok, than why do worker should work extra hours for low salary? I think it`s no fair.But thing is how much money you can bring working extra hours? Hourly can be more convinient if person has additional work like it said on this Site with reviews of Customwriting.com & also underlined by many people who work for hourly salary. But in other hand it could be better for someone to get fixed price. Don`t know! Great one! And on this page you can learn about writing statistical reports! Thanks for your article, it helps me know how to manage time over time, a very useful information! Looks like quickbooks. I think they give the same function.